Symptoms to Watch for in Your Dog: Excessive Sneezing | Dawg Business: It's Your Dog's Health! Everybody sneezes--sometimes--humans and dogs alike. A sneeze is an involuntary, forcible expulsion of air through the nose and mouth in response to irritation of the nasal passages. In other words, the body is trying to get rid of something that doesn't belong. An inhaled irritant can make your dog sneeze the same way you would. Those can include dirt, dust particles, perfumes, pollens or, in Cookie's case, I suspect she often inhales the flower with its scent when she's sniffing out critters or examining the environment for past presence of intruders. And then she'll sneeze. A couple of times. And that's that, and she's ready to continue her reconnaissance work. A few sneezes every now and then are perfectly normal and of no concern. Some dogs, especially small breeds, can start sneezing at the anticipation of excitement. No, I don't get that one. But it can happen. What if your dog keeps sneezing, though? The first thing that comes to mind, it seems, is allergies. I often feel I'm going to sneeze my brains out during allergy season. Is the same true for dogs? Not really. This is not to say that a dog could never sneeze from allergies. It is to say, however, that is quite unlikely. 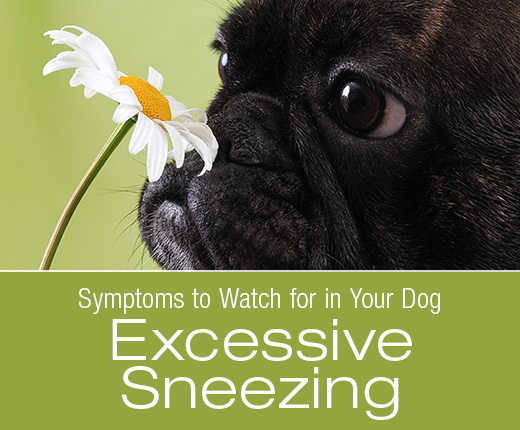 In fact, in dogs, sneezing is the least likely reaction to an allergen. Allergies in dogs typically manifest through the skin, not the nose. Let's forget the connection between sneezing and allergies. There are much more likely and quite more serious potential causes behind your dog's excessive sneezing. Well, yes, pollen or dirt particles and the like are technically foreign bodies as well. The difference is that they are tiny and a healthy sneeze or two should be enough to get them out of there. Right? Sneezing is a perfectly good system that should be able to take care of such things easily. If your dog keeps sneezing on, and on, and on, it means that whatever there is in there isn't likely to come out on its own. Yes, your dog could end up with a twig or a stick up their nose or, the most treacherous of them all, foxtails. That is no light matter. 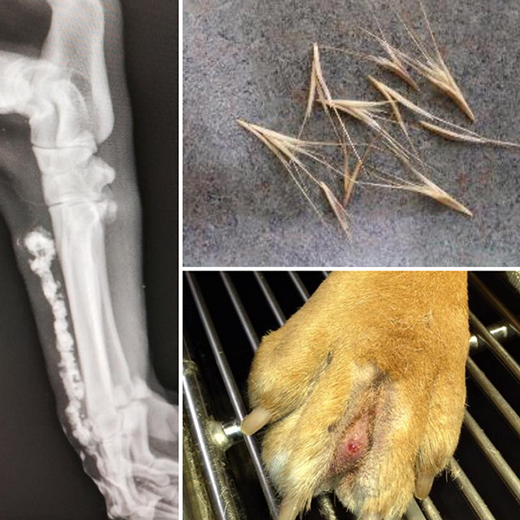 A foxtail can cause a substantial injury, and it can travel further in, all the way to vital organs! Here you can see how the foxtail traveled through tissues after entering between the toes. Such foreign bodies require veterinary intervention. Other potential signs of a foreign object in your dog's nose include pawing at the nose, nasal discharge and nosebleeds. Uncontrollable, violent sneezing is a red flag signaling a major problem such as a foxtail stuck in your dog's nose. These things are very good at getting into places and stay there. Nope, we're not talking a common cold type of infection. Bacterial or viral upper airway infections in dogs are much more likely to cause coughing than sneezing, and dogs do not get a primary bacterial infection in the nasal passages, however, they commonly get bacterial infections secondary to foreign bodies or neoplasia. A fungal infection, namely Aspergillus (or penicilliosis), is a much more likely suspect behind your dog's excessive sneezing. Other potential symptoms that come with that beauty include pain, visible swelling, and discharge or bleeding from the nose. Nasal mites are technically an infection too. These tiny bugs can cause terrible itching and trigger sneezing fits. And yes, often come with a side of nasal discharge and bleeding as well. And here is a twist for you. The infection making your dog sneeze might not even be in their nasal passages. An infected tooth or its root, particularly the third upper premolar, can cause sneezing and nasal discharge. As long as we're listing all the nasty and scary things that can be behind your dog's excessive sneezing, we must not forget about tumors. Unfortunately, that can be the cause, and it's not as uncommon as you'd wish. The anatomy of smushed-faced/brachycephalic breeds makes them more prone to sneezing or reverse sneezing spells in response to irritants or upper respiratory infections. When your dog is sneezing a lot, please, forget allergies and see that you get to the bottom of it. Those Fox tails can cause so many problems for our dogs! Talking about sneezing, many people panic or think something is wrong with my pug when she does a "reverse sneeze". She doesn't do it often, but it looks and sounds scary to those that have not seen a flat nosed dog reverse sneeze before. I know it scared me the first time I witnessed it. Yes, looks very scary. I actually have an article on reverse sneezing ready for next Thursday. Interesting! One of my dogs reverse sneezes more often during certain times of the year. I wouldn't call it excessive, but he does it for sure more often in the spring/summer than the winter. We had a full workup done by our vet who ruled out all other causes, and said that his issue was due to his allergies. My poor boy does have a lot of other allergy issues too, though. Jasmine get those sometimes too. Usually this is not an issue. It's so interesting to read that sneezing is rarely if ever allergy related. I guess we assume since it's that way with us, it would be the same for our dogs. Thankfully I've never had a sneezing issue with any of my dogs, but it's good to know how important it is to take it seriously should it every happen. Yes, projecting is the most common human reaction. We sneeze due to allergies, hence dogs must too. Not true, though. Very informative post. I 've never even heard of foxtails before reading about it here. Wow. That looks so painful! Great information to share with pet parents about the potential red flags to look for with excessive sneezing. As I always say, "when in doubt, go get it checked out!". Not every area has foxtails; around here we don't have any. So if you never heard of it, you might not have it either. Really nasty things. This was an interesting read. Lola is a sneezy cat. She had a bad URI as a kitten and developed chronic sinusitis. Now that I've gotten the sneezes under control with acupuncture, I can narrow her sneezy days down to when it rains. I'm glad acupuncture helped. We like going with integrative approach whenever we can also. So scary to think that a sneeze can be anything more than just a sneeze, but good to know what to look out for! Thanks for sharing. One sneeze certainly is nothing more than a sneeze. But a lot of sneezing, with or without discharge or blood, can be. I didn't know that nasal mites existed. Luckily, we don't seem to have any foxtail grass in our area. I would never imagined it to be such a potential problem. Every body part seems to have its own parasites. We get those foxtail things sometimes (or a similar seed) I am all over my cats like a rash hunting for them!! Foxtails are a real menace. I'm glad you never had a serious problem with them. Brûlée tends to sneeze some, especially in my home office where there are a lot of papers. However this summer when she begins sneezing and it was a bloody discharge from her nose, I knew there was a problem. It turned out she was having a violent reaction to her vaccination from that morning and she spent four days in the emergency animal hospital. I'm glad you understood the significance of what was happening. It seems she recovered from all that?